The following article focuses on the historical returns from 16 developed countries, looking from the perspective of a local investor, and assuming a strong home country bias to begin with (i.e. solely using domestic stocks and domestic bonds). 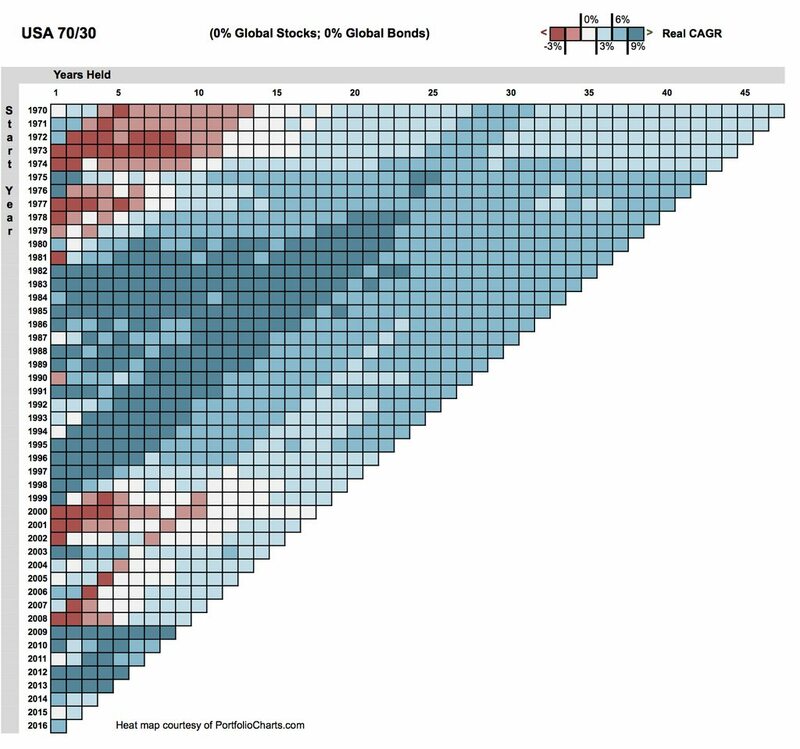 We will look at more diversified portfolios mixing domestic and global investments in Part 3. This article is the second part of a multi-part study, click here for Part 1. We will leverage various data sources which were described in Part 1, mostly based on MSCI data series for per-country stock historical returns (in USD and in local currency) and OECD for per-country inflation rates. 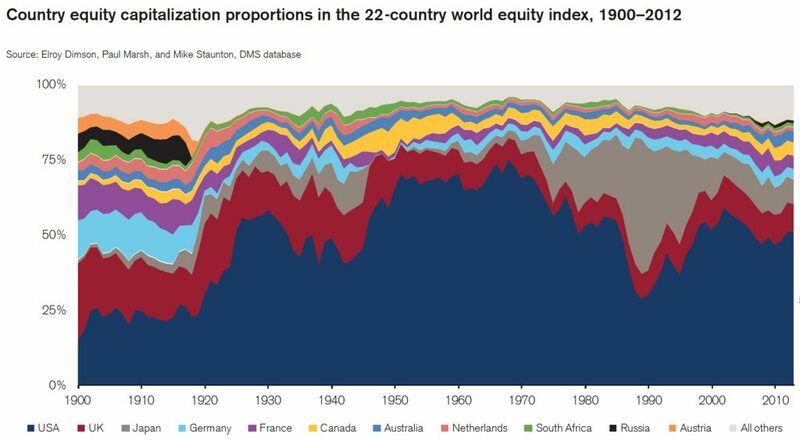 This graph was also provided for context, illustrating the evolution of per-country market capitalization over the past century. Part 1 studied a fairly extreme position of investing 100% in the world (global stocks and global bonds). The outcome proved surprisingly diverse, due to very distinct (and hard to predict without hindsight) patterns in inflation and exchange rates in the various countries being investigated. We concluded by the desire to look at more balanced asset allocations, involving domestic equities as well as global equities. Part 2 explores the opposite position of exclusively investing with domestic assets. Part 3 will seek a middle ground. In Part 1, we looked at 18 countries, but due to limitations of the bonds data set (see below), when bonds are involved in the analysis, Part 2 and Part 3 will only focus on the 16 countries where we have full data (i.e. excluding Hong-Kong and Singapore). 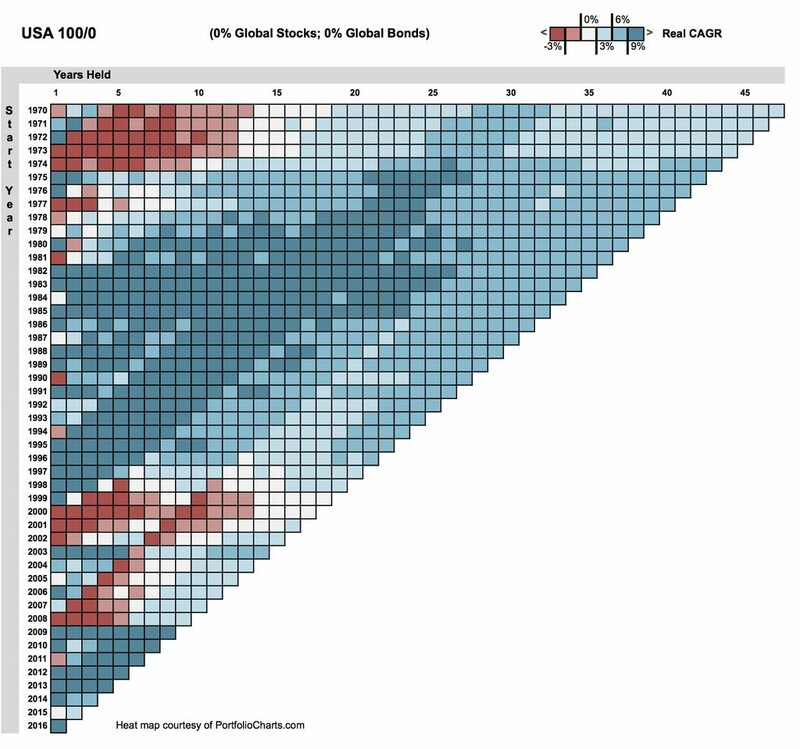 Stock returns from 1970 are fairly easy to assemble, leveraging MSCI per-country data series. Bonds historical returns aren’t as readily available on a per country basis, but OECD and IMF provide government bond (10-yrs) and bills (3-month) interest rates for all countries of interest. The OECD database is finer-grain (including monthly returns), but has major gaps in the early years, notably for bonds. The IMF database fills nearly all those gaps for bonds (on an annual basis), and for the overlapping years provides numbers which are either exactly the same or fairly close to the OECD numbers. We settled on using the most complete data series, i.e. IMF annual numbers for bonds and the OECD numbers for bills, when available. Here is a chart displaying the evolution of government bonds interest rates for the 16 countries, between 1970 and 2016. The average maturity of corresponding bonds is 10 years (according to OECD). As you can see, Japan (JPN) and Switzerland (CHE) acted somewhat independently, while the other countries largely followed each other, at least starting from the 90s, with a collective drift towards low interest rates. The next step is to use those government bond and bills interest rates and derive (nominal) returns. Here AlohaJoe came to the rescue, leveraging his extensive experience with the bond fund model, and the various ways to go from bond rates to returns. 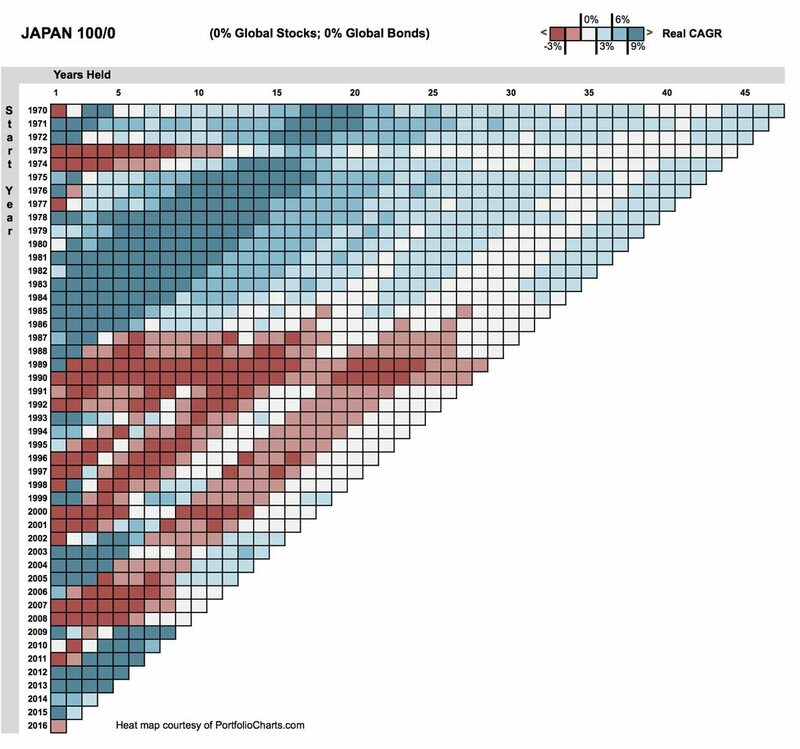 This allowed to construct full intermediate-term bond returns data series for each of the 16 countries, with just a few years missing for Spain (1970 to 1978). We made a rough guess for those few missing numbers, taking the average of the other countries (except Japan and Switzerland). 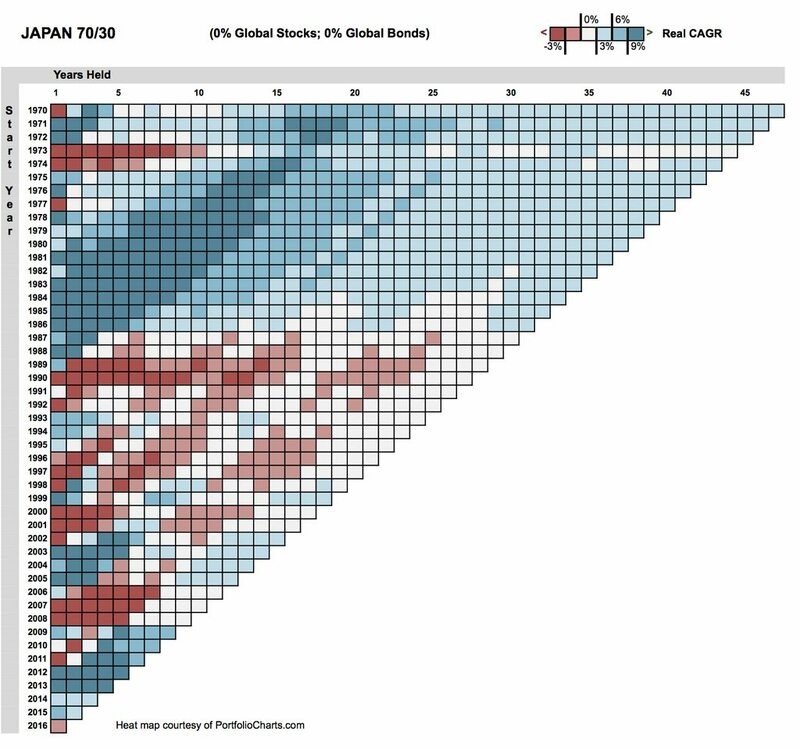 A sanity check with known US bonds returns and some known international bonds returns expressed in local currency provided reasonably satisfying results when comparing growth charts of known returns against modeled returns. Still, please keep in mind that those are simulated numbers, just a baseline for approximate analysis, not actuals. Finally, using the inflation rates determined in Part 1 of this study allowed to derive real (inflation-adjusted) bonds returns for all countries and years of interest. The first instinct of many investors is often to stick to known quantities, i.e. domestic equities. This presents the great advantage of reducing currency risk, and the disadvantage of making a narrower bet, restricting diversification. Let’s investigate a 100% domestic stocks asset allocation, and see what would have happened between 1970 and 2016 to a local investor with a initial investment made in 1970. The following charts use returns expressed in local currencies, and real (inflation-adjusted) returns. The outcome is fairly diverse, to say the least. Italy stands out as the worst under-performer (followed by Austria, Spain and Japan). Hong-Kong, Singapore and Norway displayed extreme volatility. While Sweden, Denmark, Belgium and the Netherlands did remarkably well. As to the US and Canada, they stand out by displaying solid growth and low volatility (relatively speaking). Also note the extreme volatility of Norway (probably due to its high dependence on natural resources industries, e.g. petroleum). Let’s look at maximum drawdowns now (using annual returns, hence not accounting for intra-year events; also remember those are real returns, inflation-adjusted). Holy smokes. It is probably a safe guess that few people outside North America would want to be 100% domestic stocks after such a ride in the past four decades. Diversification is clearly in order, using a mix of bonds and global equities. Please check here for explanations on how heat maps work. Click on the images to see more details. Quite obviously, if you see some level of red on a row after 20 years or so, then it’s a heck of a drawdown period. And if you see white after some 30 years, then you can probably forget about the “4%” withdrawal rule. Besides Sweden, Canada, the Netherlands and Denmark also did remarkably good, while Spain struggled as mightily as Italy. There is something to be said for cold weather, as an early reader pointed out! It would probably never come to anybody’s mind to invest in 100% bonds, but it is interesting to look at those numbers in isolation, if only to acknowledge that bond returns, when expressed in real terms, can suffer from quite some volatility and drawdowns. Here are the corresponding charts. The biggest problem was of course the oil crisis in the 70s, with inflation devastating bond returns all over the world. So far, so good, the volatility appears well contained. This is rather misleading though. Let’s check the maximum drawdowns (remember, this is expressed in real terms, adjusted for inflation). 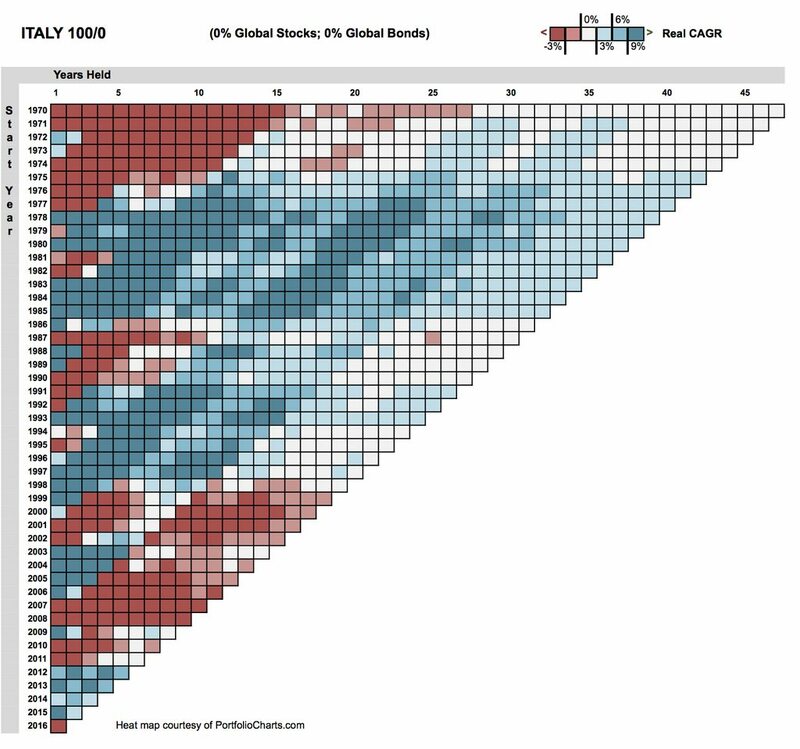 Some readers will probably be surprised by the bonds drawdowns of 25% or more for most countries (including the USA), and the extreme cases of Spain and Italy. Inflation and rising interest rates can be truly devastating for government bonds, and this becomes very visible when expressing returns in real terms. Now if somebody has a theory about the remarkable performance of bonds in Denmark, please share. In most cases, it actually took between 10 and 20 years for bonds to recover in inflation-adjusted terms. Here is the drawdown trajectory of the USA (quite severe) and Italy (OUCH! ), based on annual returns. Yes, this does represent bonds, not stocks. We didn’t witness any bond crisis in the few recent decades, which makes us subject to recency bias, but truth is a severe bond crisis can be even more frightening than a severe stock crisis, if only because of their duration and somewhat insidious nature (harder to perceive in day-to-day nominal terms). Clearly, investing 100% in stocks or 100% in bonds isn’t quite reasonable, notably when seeing the devastating crises which occurred in some countries for either asset class. Let’s examine a 70/30 portfolio (30% bonds) like we did in Part 1, while sticking to domestic investments for now. 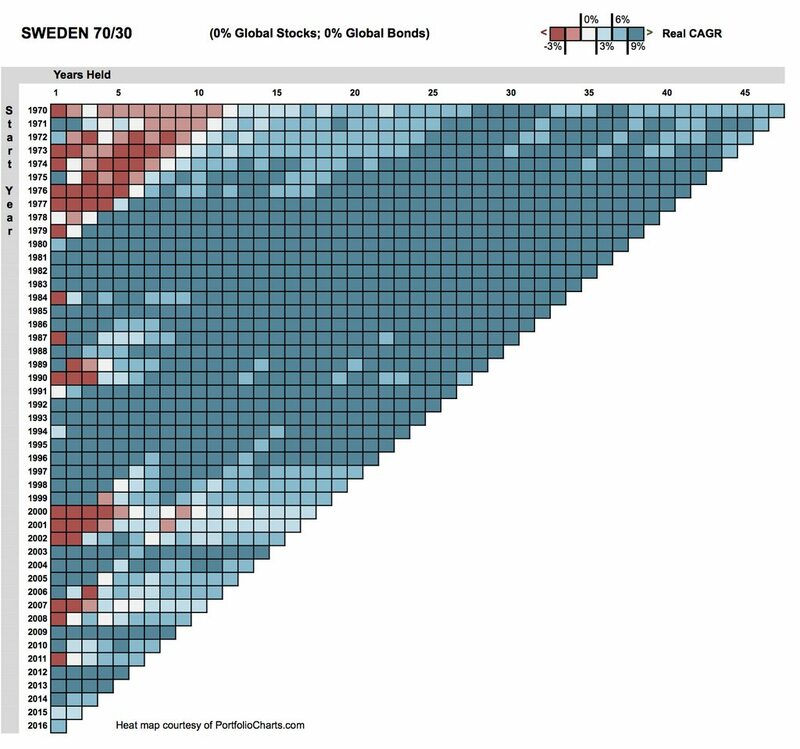 Norway stands out as highly volatile, and Canada and the US as remarkably stable (relatively speaking). Italy remains disturbingly low growth. Sure, there is some progress compared to the 100% extreme allocations, but this is still VERY painful for multiple countries. And given the disturbing trajectory of bonds during the oil crisis, a 50/50 asset allocation would have still been quite troublesome. 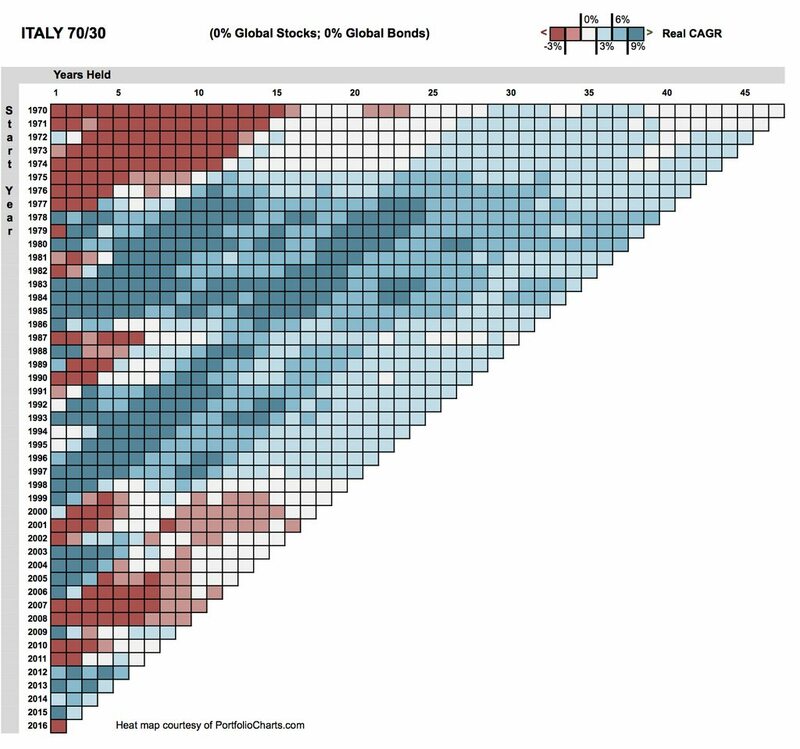 To get a better picture for various starting dates, let’s use again the Heat Map approach from PortfolioCharts, and focus on Italy, Japan, Sweden and the USA. Even with a 70/30 asset allocation, we continue to see 30+ years periods with no meaningful (real) returns for the most troubled countries. Click on the images to see a bigger version. Finally, let’s take the perspective of retirees, and compute the Safe Withdrawal Rate (and portfolio CAGR) for the worst 30-years periods a local retiree could have faced since 1970. We will explore in Part 3 how much of a mitigating effect a mix of domestic and global investing would have had in the various countries we’ve been studying.